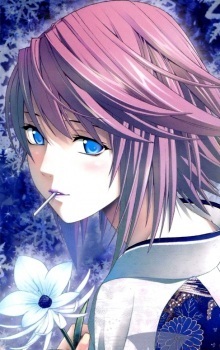 Birthday: December 7 Height: 156 cm Weight: 45 kg Three sizes: 83-56-85 Mizore Shirayuki is a yuki-onna who is in the same homeroom class as Tsukune and Moka, frequently seen with a lollipop in her mouth. Her outfit consists of a white wide-necked sweater with blue sleeves over a black tank top, a short plaid yellow skirt which is part of the Yokai Academy's girls' uniform, pink and violet stockings (her right stocking slightly longer than her left), and a belt that is wrapped around her left thigh. Mizore returns to school after a delayed absence and was first portrayed as a lonely, somewhat depressed, and misunderstood girl. She becomes infatuated with Tsukune, going so far as to create her own journal/scrapbook with all of his newspaper articles. In the past, she confessed her love to a teacher until he began taking advantage of her, freezing him as a result. With the incident and rumors spreading about her, Mizore made it hard for herself to trust anyone, but took a liking to Tsukune, believing he was just as miserable as she was. She eventually regains her sense of trust after Tsukune intervenes when the same teacher returns to kill her. Unfortunately, this leads Mizore to stalk Tsukune on a daily basis (from around 340 spying locations, according to her). She initially sports long hair in her debut appearances, but cuts it short after the incident was cleared. Later in the second serialization, Mizore decides that even if Tsukune doesn't fall in love with her, she will follow him forever. A running gag in the series is that Mizore always appears unexpectedly in the oddest locations (under tables, behind doors, the ceiling, bushes, and even in the bathroom), and freezes any girl to disrupt any sort of tender moment Tsukune is having with the latter. Keeping in line with her kind, Mizore has the ability to control snow and ice at will, and while doing so, shapes claws of ice around her hands (her hair becomes ice on rare occasions). She can also make almost perfect copies (if a bit fragile) of herself and others with it as well, each capable of independent thought. She is also very sensitive to flames, a common weakness for ice-affiliated creatures, which was shown in one episode of the anime when she got her hand burned while preparing curry, freezing the dish on instinct as a result.